Who knew that a night at the movies would set off a torrent of onion, ginger and garlic chopping, a spice drawer purge and some of the most sumptuous curries I have ever created in my kitchen? I didn’t. But recently I paid an exorbitant $35 to watch a TIFF Food in Film movie called The Lunchbox and forgot all about my sticker shock once the reel began, reveling in the click-clack of Bombay trains coursing over tracks as thousands of freshly packed, hot tiffin boxes made their way to hungry civil servants, just in time for 1 pm lunch. The Lunchbox charmed with a sweet, unexpected love story based on a lonely wife’s kitchen wizardry. 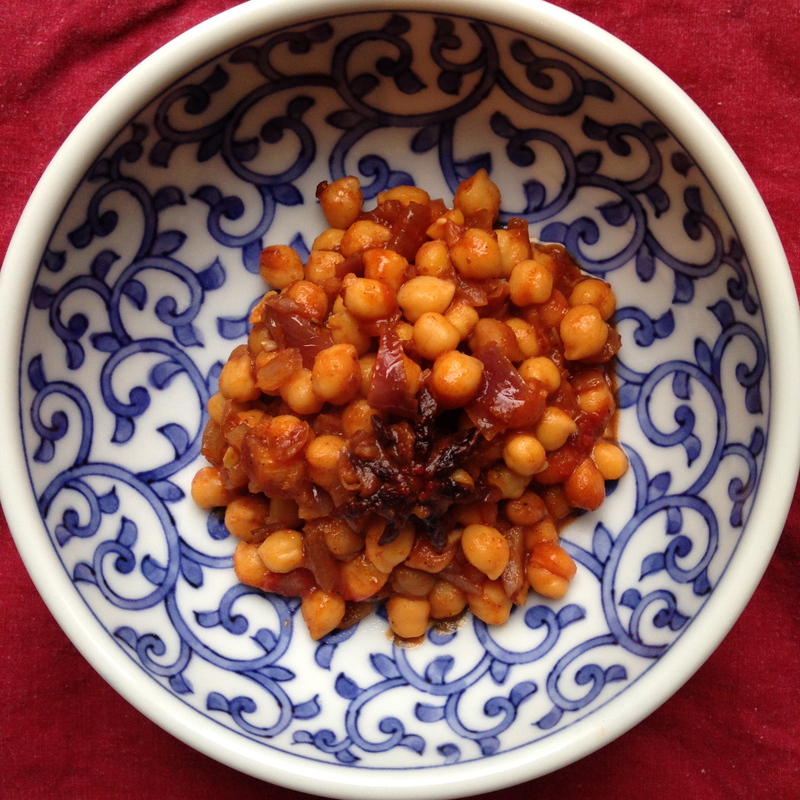 As she dipped into spice baskets and seductively licked a smear of sauce off the palm of her hand, I too, longed to dive back into my kitchen and suffuse it with the perfume of cardamom and nutty richness of toasted cumin. But after the last credits rolled and the lights turned on, out stepped CBC’s Matt Galloway and the owners of Vancouver’s Vij’s restaurant holding microphones, ready to discuss the film on the stage before us. Galloway and Vij’s heads both snapped in her direction. “Don’t look so shocked,” she said. “I love my kids, too. And get sick of them, also,” she giggled. I was instantly hooked. She talked about the blood, sweat and tears she put into the writing of her two cookbooks and why her restaurant kitchens are staffed by women only. I figured anyone who had such a fine philosophy about food, children and kitchen ambience, was my kind of cook and I instantly nabbed a copy of Vij’s At Home. I started with cauliflower, the lowly crucifer vegetable that plays a pivotal role in The Lunchbox and is generally adored by Indians. Aloo gobi (potatoes and cauliflower) is a standard you’ll find in most cookbooks and Indian restaurants. I’ve made it many times and have always felt a little let down by the results. It takes a lot to push this plain white veggie with its sulfurous odor into the realm of “Ah ha!” but Meeru’s Spicy Cauliflower Steak does just that. Her culinary tricks include half a cup of oil (I cut that in half), a slow braise in a rich sauce and a goodly punch of whole cloves. 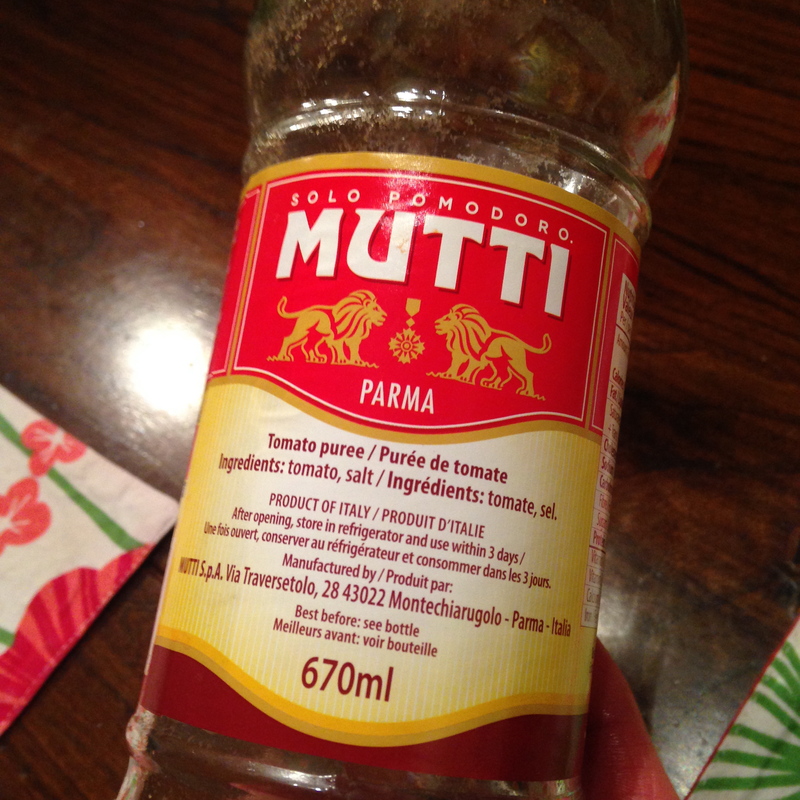 It didn’t hurt that I used one of the finest brands of pureed tomatoes: Mutti made in Parma, Italy. This passata (tomato puree) is sweet, luscious and has a Hindi-kind of ring to it. 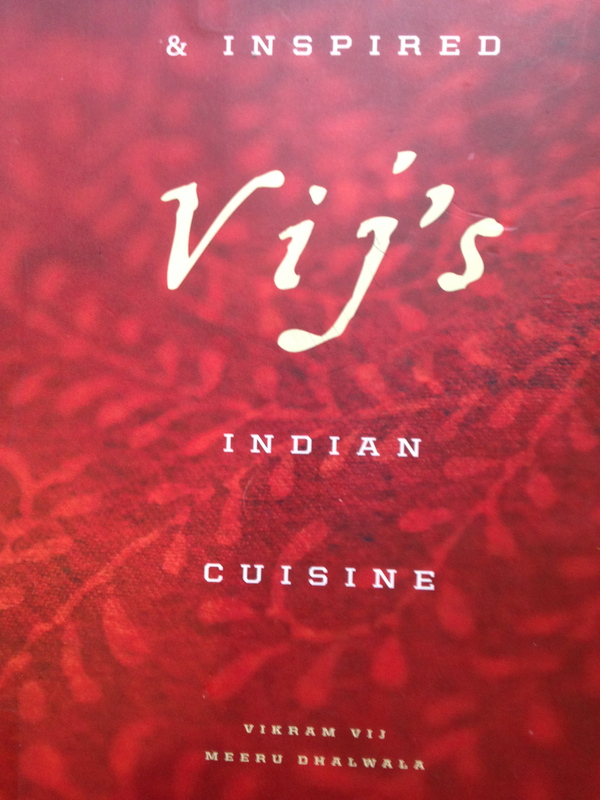 The Vijs had mentioned on stage that they drink wine with every Indian meal they prepare and that their default – or other favourite cuisine – is Italian. The more I perused their cookbook, the more I sensed a Parma-Punjab fusion going on. Such as “Ground Fennel Seed Curry”, in which a rich marriage of fennel, tomato puree and cream creates the perfect sauce for fish, seafood or chicken. Among Indian cookery, this dish is super easy and fast. You decide whether to serve it plain (vegetarian) or drape it luxuriously over some protein. Serve on basmati rice or even linguine. Heat a 10-inch heavy-bottomed frying pan on high for 1 minute. 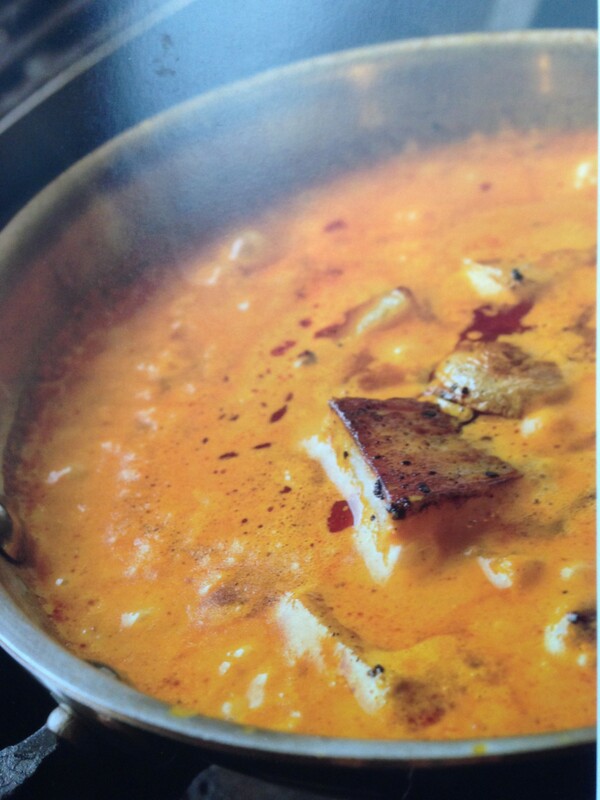 Add fennel seeds, and stirring regularly, cook for 2 to 3 minutes, or until slightly dark and fragrant. Pour roasted seeds onto a plate and allow to cool for 20 minutes. Grind the fennel seeds in a spice (or coffee) grinder. Set aside 2 Tbsp ground fennel seeds for this recipe. Store the remaining seeds in an airtight container in a dark cupboard or drawer for use in other dishes. In a medium pot, heat oil on medium for 1 minute. Add ground fennel seeds and stir continuously for 30 seconds, or until fennel begins to foam lightly. Carefully and immediately add tomatoes, stirring well. Add salt, turmeric, cumin, fenugreek seeds and crushed dried chillies and sauté for 5 minutes, or until oil glistens. Pour in water and cream. Stir and bring to a boil. Reduce the heat to low, cover and simmer for 5 minutes. Gently poach a pound of fish fillets, shellfish or chicken pieces in this sauce until just done. Serve over basmati rice or pasta. 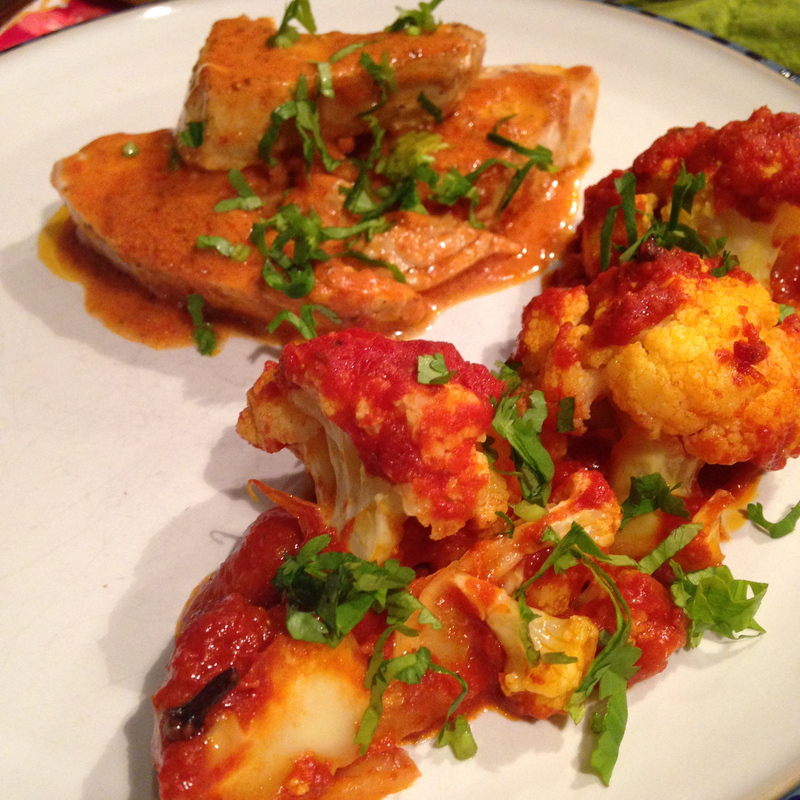 Cod in fennel curry sauce and cauliflower steak.